Crepes, or thin French pancakes, are the perfect hearty breakfast. 1. Preheat oven to 400°F. 1. In a blender, puree milk, flour, water, eggs, butter and salt to make the batter. 1. Place a 10-inch nonstick skillet on stove over medium-high heat. Coat skillet with cooking spray. Add just enough batter to thinly coat the bottom of the skillet, swirling to coat. 1. Cook until edges begin to dry, about 1 minute. Flip crepe and continue to cook about 15-30 seconds more. Transfer to wax or parchment paper. Repeat process with cooking spray and remaining batter, stacking each crepe between pieces of parchment paper. 1. Using the same skillet and cooking spray, cook just the bottom side of 8 eggs (top should still be raw). 1. 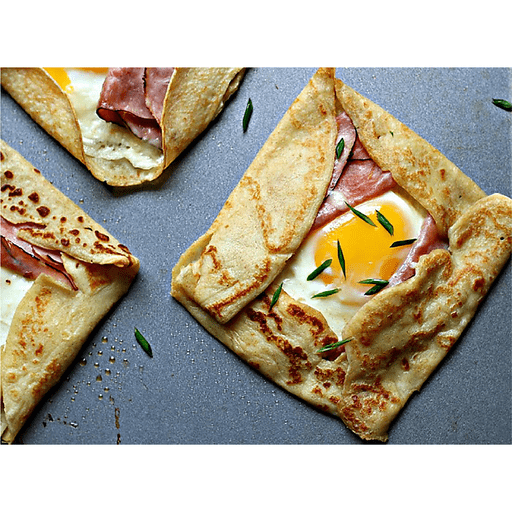 Divide ham and cheese evenly among crepes. Add fried egg to each. Fold each crepe into quarters and transfer to a baking sheet coated with cooking spray. Bake until cheese is melted and egg is cooked on top. Garnish each with green onion (optional) and serve. Calories 240, Total Fat 13g (Saturated 6g, Trans 0g), Cholesterol 260mg, Sodium 370mg, Total Carbohydrate 15g (Dietary Fiber 0g, Sugars 3g), Protein 15g, Vitamin A 10%, Vitamin C 0%, Calcium 10%, Iron 10% *Nutritional values are an approximation. Actual nutritional values may vary due to preparation techniques, variations related to suppliers, regional and seasonal differences, or rounding.